Not sure how I missed these gems. Both of these videos have been on Youtube for a number of months and I am just getting to them now. The first is an old school video tour of the B&OCT 75th St tower shortly before it closed in 1996. This was one of the last major "all mechanical" interlocking plants that even had a number of mechanically worked signals. It was located on the joint B&OCT/PRR Panhandle trunk line that snaked its way up along the western part of the city through Dolton Jct, Brighton Park, Ash Street and many other complex crossings and junctions. By 1996, the PRR was gone, both both the Wabash and Belt Railway crossings were in place. The videos shows movements passing by the tower, but also the operator manipulating the 132 lever S&F mechanical frame. One interesting thing to note is how the facing point lock levers were stored in the unlocked position, instead of locked as seen at most other North American towers. Make sure you have some time booked, because even at 46 minutes you'll want to watch the whole thing. The second video is an inside tour of METRA Tower A-2 shot in 2015. I have previously covered this tower on this blog and I was actually able to use info from the video to solve a few mysteries such as where the rundown timers were. So check out the video and feel free to check back with the Tower A-2 page on this blog for the updates. Lastly I found some vintage clips of MO interlocking and tower in operation in a 1975/76 public information film on railroad operation. Begining at the 8:13 mark is a segment on signaling that includes film of the big old GRS Model 5B machine being manipulated inside MO tower, along with its model board showing switch position indicators. Fancy stuff! Found two interesting websites with some top notch non-North American signaling diagrams. The first is called SA Track and Signal and features all manner of track and signaling diagrams covering a significant portion of the Australian rail network. Australia is a government owned model with lines being leased or trackage rights assigned. This site looks like it caters to crews that need to qualify on unfamiliar lines. Everything is in full color PDF's that starts at the regional scale and allows one to click down to the individual track and signal diagrams. Signals are represented in full detail along with signs and other operating information, however these are not interlocking charts and switch numbers along with other signaler oriented information is not provided. The other site I found hosts UK diagrams from the Glasgow suburban area, but the website itself is not railway related. That is because it is a public access freedom of information site that put up a number of track and signal diagrams that were requested under a public information request. These are much like the Australian diagrams with full color representations of the signals, but there is no convenient tree of linked maps. The low level diagrams are provided on a web page list and you have to sort through them yourself. These diagrams do include track and turnout speeds. Diagrams such as those apparently exist for the entire UK for use as training aids, but are not often made public due to misguided terrorism concerns. Keep on the lookout because they are widely distributed and do show up from time to time in Google. The Bad Aibling rail accident was a head on rail collision that took place on February 9th, 2016 on a single track portion of railroad near Bad Aibling Germany. As of this writing the investigation is pointing towards human error on the part of the signalman and, more specifically, the fact that the signalman was playing a game on his mobile phone around the time the events of the accident occurred. Now. while phone distraction has played a role in previous rail accidents, in this case I believe the true culprit is the design of the German railway signaling system itself and any claims of distraction are simply an easy answer. First let's deal with the issue of distraction. Unlike operating a vehicle, operating a tower or dispatch interface does not require constant attention. Of course it is better to have someone paying attention, but it is not unsafe and moreover, distractions are already built into the job. Operators frequently have to use the restroom, eat meals, talk on the phone to other railroad employees or even leave the tower to deliver train orders. In a job filled with distractions, the whole point of the signaling system is to prevent distraction from leading to accident. It is a fundamental principal of railway signaling for things to fail safe. 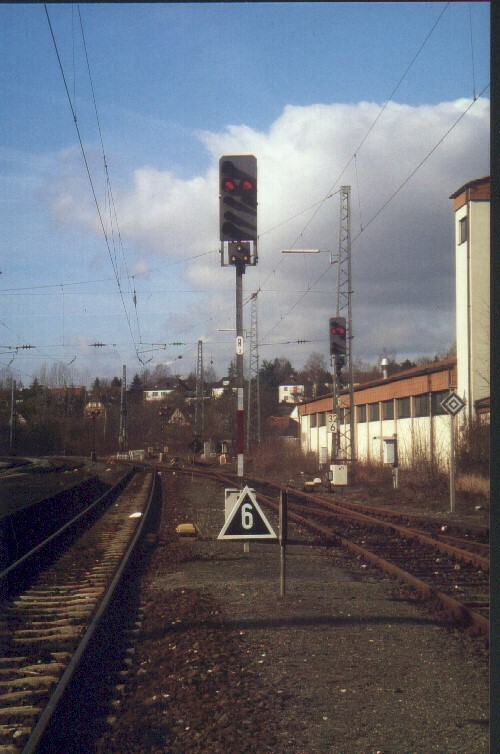 The mechanism that allowed two trains to end up in a cornfield meet is the Zs1 signal, shown above. Known as an "Ersatzsignal" or Substitute signal it is placed below a "main signal" and lit upon command of the signaler when the main signal cannot be displayed normally. 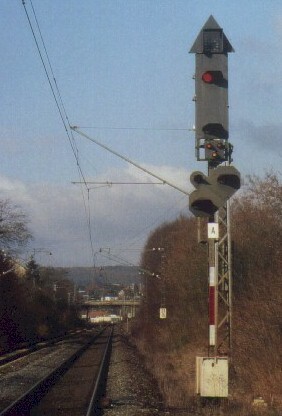 Many in English speaking rail circles have described it as a Restricting or call-on signal, but that analogy is not entirely accurate. In practice it is more like a manual block clear of the type that can still be encountered on the LIRR. Trains pass the Zs1 and proceed through all turnouts at no more than 25mph and before they can increase to normal speed . 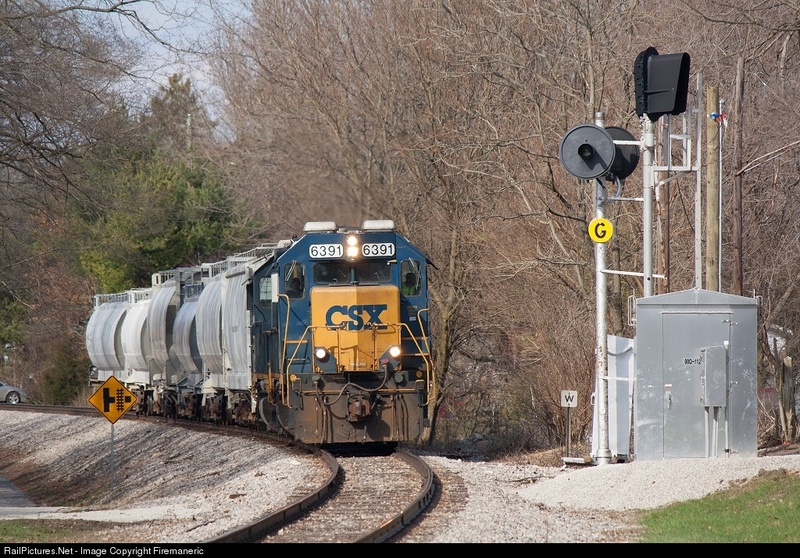 Some sources state the 25mph limit applies to the next main signal, but a majority say normal speed and that would agree with the behavior of the second train involved with the accident. The Zs1 signal is displayed when, for any reason, the main signal governing movement into a section of track, cannot be displayed. 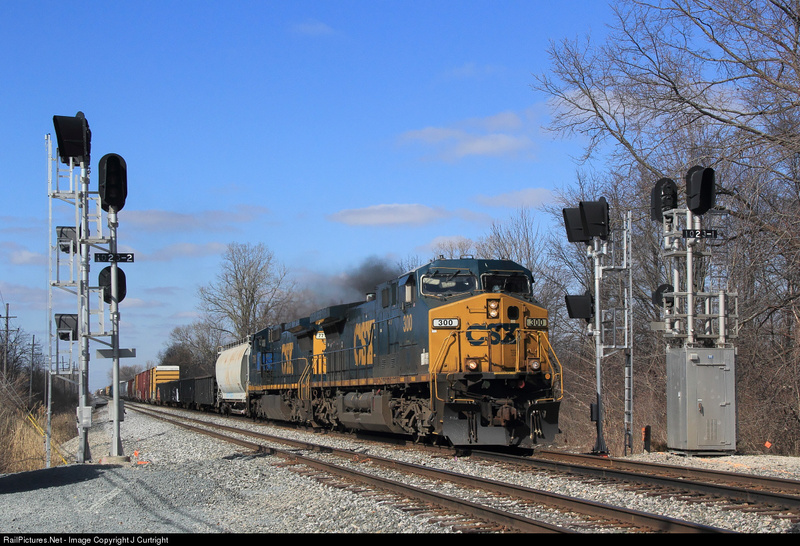 This can be due to a bulb out condition, an axle counter miscount or any other problem with the signaling system. As far as I can tell, the Zs1 guarantees route locking only. In most rail systems around the world, when the signal system fails trains must proceed on sight prepared to stop short of an obstruction or other problem. This is because even in the case where the cause of the failure is known, that doesn't mean a second problem might exist. Because the situation of compound failures can lead to accidents, in most of the world a substitute signaling system must replace the automatic one to relieve trains of this burden of traveling at Restricted speed . 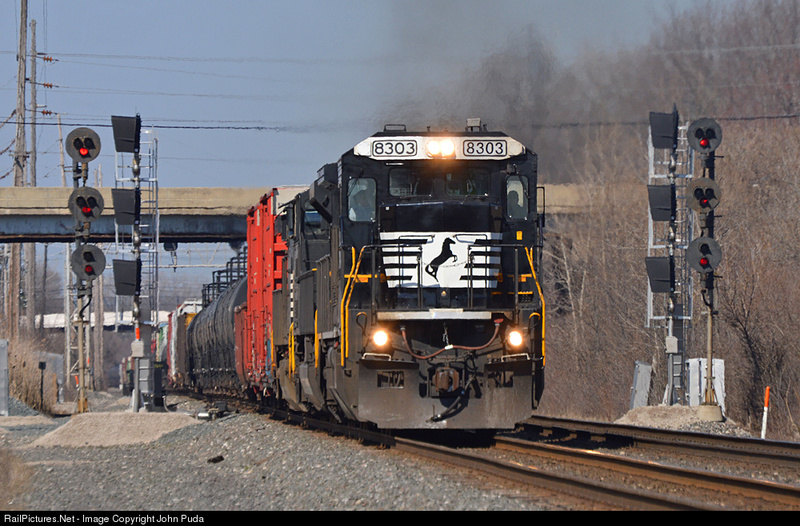 As one might expect, performing this task can be quite involved, requiring multiple signalers and communicating the fact to many trains and qualified employees. However in Germany all it takes is a button press to light up the Zs1. In North America there is no signal that can be displayed into a CTC block where traffic is set in the opposite direction in the same way a Zs1 is used in Germany. You can't even give a Restricting against the flow of traffic, necessitating a permission past stop procedure and even then the train will continue to be limited to Restricted speed. The permission past stop procedure involves speaking to the locomotive engineer, usually over an open radio channel. Yes. dispatchers in North America can screw this up, but the procedure takes time, requires two persons and requires the operator or dispatcher to pay attention. In Germany the signaler presses a button and the train operator heads on his way. When used for routine problems like bulb out or axle miscounts the process can become rote and the procedure can be shortened or skipped entirely. Unfortunately I don't as of yet know what the Zs1 procedure involves, but I from what I have read it consists of ensuring that the block is actually free of obstructions. A newer signal, Zs7 Caution, is used in places where the signaler is unable to positively determine block occupancy and does in fact require the train receiving it to proceed at Restricted speed, but the problem of actually setting a route against traffic remains. 313 absolute signal where the Zs1 was displayed before the collision. Annotated version. While misuse of the Zs1 was the ultimate cause of the accident, there were a number of other systemic factors that contributed to it. First, closed channel radios are employed in theory to prevent "confusion" over who is speaking to whom, but the end result is that train operators are kept in the dark. Furthermore, in the case of the Bad Aibling accident closed channel radios actually prevented the signalman from being able to stop the trains involved with a radio call because he forgot the correct emergency broadcast code to use. You know, as opposed to pushing transmit to talk. Second, the use of axle counters as a cheap alternative to track circuits, only serves to further ingrain the manual block thinking. Detecting track occupancy without track integrity only perpetuates the inability of distant signals to stop trains. Moreover, while axle counters are prone to failure (or miscount), just like track circuits, the signaler is able to reset the problem on his own with a button, instead of needing a maintainer to fix it. While some can see that as a feature, it removes a valuable form of two person control. Again, fixing signal problems via the interlocking panel becomes habitual and eventually an accident happens. Panel blocking was a basic way the PRR made operators think twice before bypassing signal protections. Most signaling systems have their single point of failure. 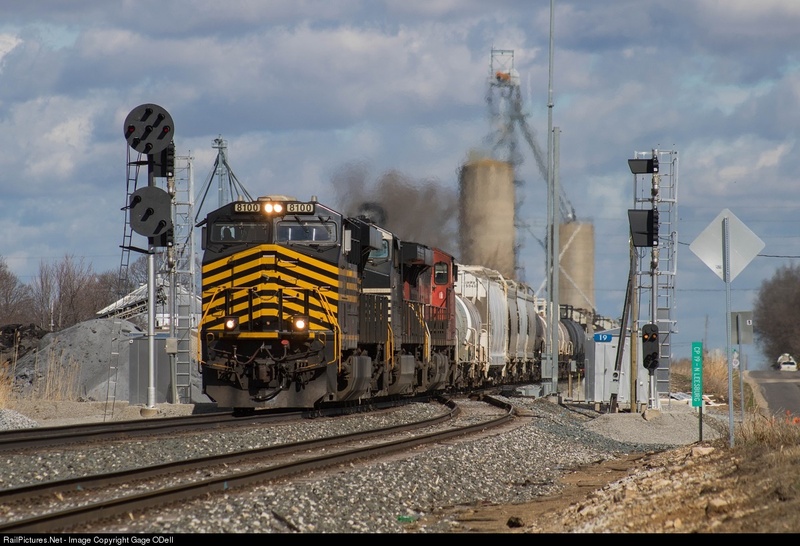 In North America there isn't anything preventing an operator or dispatcher from giving a bad Form D and running a train into another on a stretch of single direction ABS track. However for the last 50 years we have been on a quest to eliminate ABS and replace it with something where such a mistake cannot be made because the technology prevents it. 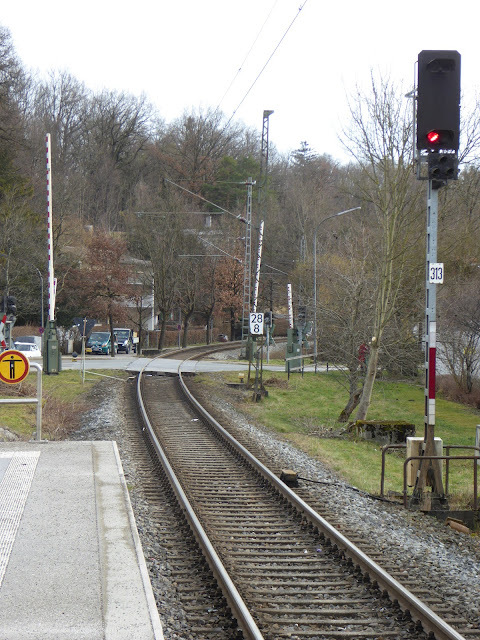 Germany however, despite all its fancy train protection systems, flank protection and signal overlaps, is still burdened with 19th century thinking when it comes to block systems. As a society Germans are really good at following procedures so therefore these sorts of accidents are rare, but allowing something like the Zs1 still tempts fate and every so often you get burned. Note: This is my 261st post. Yay for important milestones! I'll start off with the most devastating news. 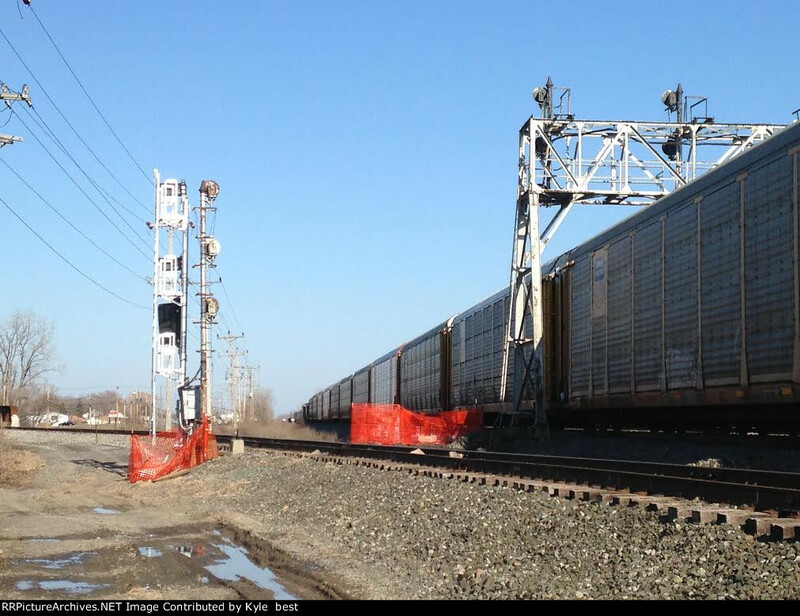 It looks like the CSX Chicago Line re-signaling project in New York has finally reached the 4-track raceway in the Buffalo terminal area. This is pretty much the finest example of NY Central small target searchlight signaling there is and also one of the last. Out in Indiana, the Monon Sub, previously notable for losing its historic semaphore signals, is now losing its searchlights. I always wanted to try and photograph these from Amtrak's Cardinal, but the signals on the daylight portion of eastbound trips had already been resignaled and the remainder saw the train in the hours of darkness. If you think this scene from Michigan is more irrational disposal of new signal hardware you would only be partly correct. These are C&O style signals being replaced by Seaboard. No more economy lower heads without a red lens and no more Y/Y Approach Slow. Why use 2 signal heads and 5 lamps when you can use 3 heads and 7 lamps! The CSX Toledo Sub continues to get hit at an uneven pace. This B&O CPL gantry is an especially regretable loss. 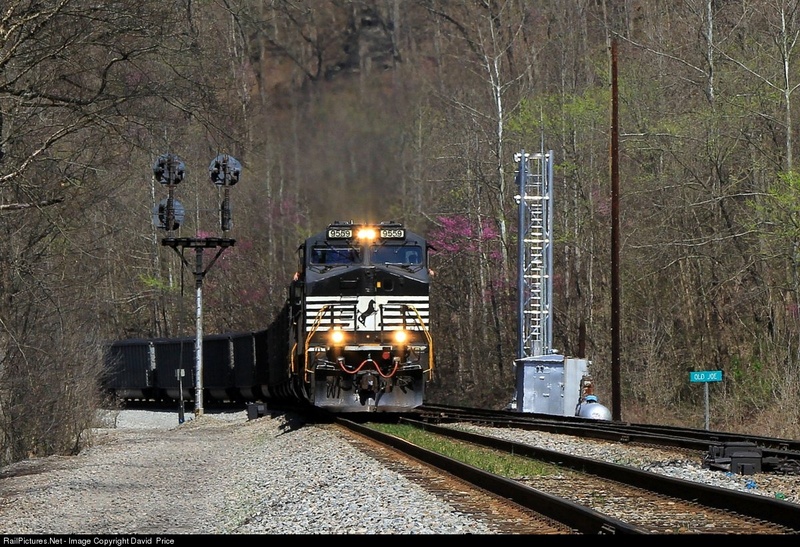 Last month I reported on NS Marion Branch PRR PL replacement. Well now I have confirmation that it does not just apply to automatic signals. NS seems to be under the impression that the former N&W routes through coal country still have a future. I don't even think these lines would need PTC due to the lack of any cargo other than coal and empty hoppers. Come on, give the Pokey the Raton Pass treatment. Chicago Line resignaling is still moving through Ohio. I'm really going to miss those two lamp G heads. Well that's pretty much all I can stomach for now. Hopefully next week I'll have something more inspiring.